After almost a year, this is the best purchase I’ve made for my cat. He loves playing, sleeping, and hiding in it. Dimensions 35.0 In. X 25.0 In. X 3.0 In. My cat loves this he plays in it for hours! It's decent size for a full size cat. It's extremely easy to fold up and put up. It has a little tiny ball in the middle hole that he runs through and beats up going through. I'm going to order another one for his play room . Very nice for the price. I would recommend to a friend! I bought this for my 2 cats, 5 yrs old. It's well made and exactly as pictured. I love the opening in the center, it gives the cats another place to play when they go inside. Also it's very quick and easy to collapse and fold up using the loops and buttons on the ends. My cats immediately started playing with it and they love it!! Our full-grown cat loves this tunnel. She likes to rest in it when she wants peace and quiet. She also enjoys hiding in it and batting at toys I dangle through the openings. 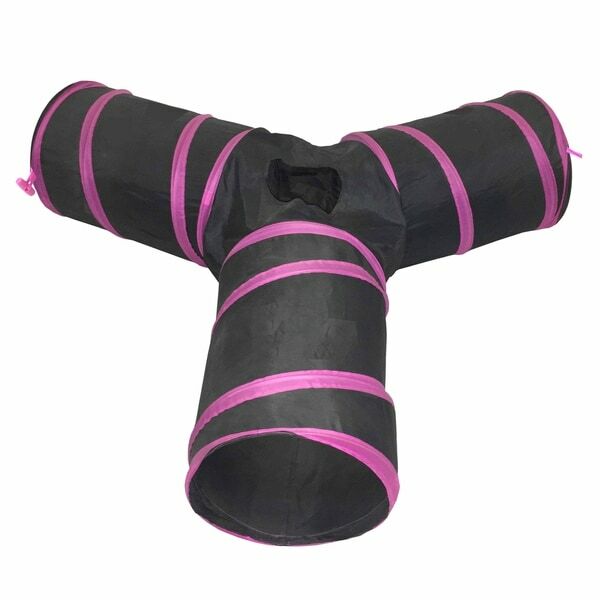 The tunnel is collapsible and easy to store away. I'm very happy with my purchase! My cats really enjoy it. If you have a cat that likes climbing in bags or boxes they will really like this tunnel. It's not huge and easily collapsible so it won't take up too much space. I purchased this tunnel for my two pet rabbits and i have to say they absolutely love tunnels. It is probably the best thing i have bought for them. It is pretty and very well made and durable. You won’t regret this purchase. I can't even begin to explain how much my cats love this. It's super easy to set up and it's really durable. They drag it all over and run into it w/o any wear and tear. It's so cute seeing their little heads pop out the top. We might even get a second for another room we love it so much. This keeps the kitties busy for hours. They love it and so do I. I have a friend that has a smaller version of this and now she wants this version as well. I would recommend this to any cat owner. They love this tunnel. The ball inside was killed within the first day, but they still use it anyway. Even my adult cats love to play in it. I bought this for our bunnies. They love the tunnel! They can hide, hop over, and go crazy. It is a very good purchase for bunnies exercise.